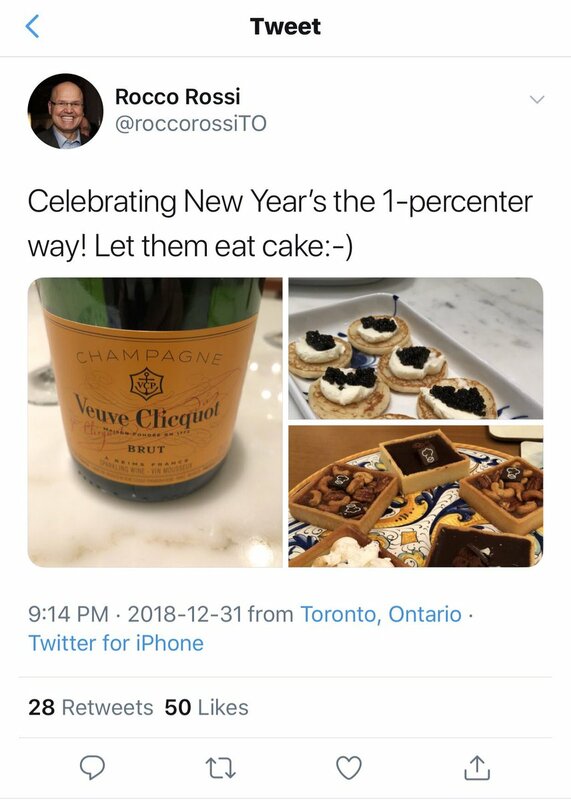 On New Year's Eve, Rocco Rossi, president and CEO of the Ontario Chamber of Commerce (OCC), chose to finish off 2018 with a crass attempt at humour he later said was "meant to be satirical." "Celebrating the New Year's the 1-percenter way! Let them eat cake:-)" he said, in a since-deleted tweet accompanied by pictures of a bottle of Veuve Clicquot champagne, caviar and canapes. Screenshot of Rocco Rossi's since-deleted New Year's tweet. From most people, such a statement would provoke little more than a yawn. But Rossi has led the OCC's lobbying efforts over the last year to roll back the planned minimum wage increases introduced by the previous Liberal government, and to repeal Bill 148, which introduced a host of workplace reforms that particularly benefited the growing number of part-time and contract workers. To tweet out images of conspicuous wealth accompanied by feeble humour about the one per cent, almost at the very moment at which the cancelled pay increase for Ontario's lowest paid workers would have taken effect, was the very definition of crass insensitivity. Under Rossi, in recent months, media releases from the Ontario Chamber of Commerce have read almost like they were written by the provincial government. On November 21st, Rossi announced triumphantly: "On behalf of our 60,000 members in 135 communities across the province, we are pleased the Government of Ontario is holding strong in its commitment to make Ontario open for business." My company is one of those 60,000 members. For the record, I, and many other Chamber of Commerce members, do not thank Premier Doug Ford for his needless, shortsighted and counterproductive attacks on "the little guy" since he entered office. Rossi's statements suggest a unanimity of opinion within Ontario's many Chambers of Commerce that does not exist. Watch: Grading Ontario's "open for business" signs. Blog continues after the video. In approximately a decade as a Chamber member, I have never been asked for my view on policy, and nor, I assume, have the vast majority of other members. Like most members, my company joined our local Chamber because of the practical benefits of membership it offers: networking with potential clients and access to health-care benefits, among others. We had no desire to be co-opted as supporters of antiquated policy positions we play no role in creating. The Chamber is a broad church, containing members with a range of political perspectives. Presenting Ontario's businesses as universally supportive of Premier Ford's actions demonstrates an OCC leadership out of touch with, or apathetic of, the full range of opinions of its membership. Undoubtedly many members did oppose an increase in the minimum wage to $15 and other employment reforms. Others felt that the increase to $15 from $11.60 in 2016 was too rapid after years in which the rate was almost static. Those opinions are certainly valid. But increases to minimum wages, in Ontario and around the world, give rise to promises of job losses and bankruptcy with tedious predictability. In fact, such increases, as in 2018, often do not result in the doom that is predicted. In July 2018, unemployment in Ontario fell to its lowest level in 14 years. A rapid increase from $11.60 to $14 has caused no measurable negative effects on total employment. More importantly, we need to understand who benefits from a minimum wage that is too low, and who really pays the price. A family I know well has two parents earning minimum wage: a father who works full time, and a mother who works as close to full time as is possible with a family of four school-age children. Their total income for working long hours in arduous manual jobs does not come anywhere close to giving their family enough to pay rent, buy food, and maintain a decent standard of living. So what happens? The government has to step in and subsidize them through Ontario Works and a range of other payments. In other words, the family's employers are being subsidized by Ontario taxpayers to underpay their staff. What could be less "conservative" than that? But it goes further. Low-wage employers demand that all the unnecessary costs of people living in poverty, above all greatly increased health-care costs, should fall on taxpayers. Taxpayers are paying for bad business practices. Opponents of better wages such as the OCC often point to small and medium businesses as those most likely to be negatively impacted and to become financially unviable. But it is not those companies which lead the charge against decent wages. It is big business which many believe drives the OCC's perennial opposition to minimum wage increases. The rank and file membership, as Chris and Pete Neal of Neal Brothers Foods pointed out in an article for Better Way Alliance, has shown surprisingly little interest in the subject. It is also big business which is by far the most likely to pay minimum wage, as Statistics Canada has shown. Meanwhile, many small businesses and start-ups are keen to emphasize their commitment to decent wages and their need to keep staff long-term by paying them well. It is businesses with vision and insight that sign up to the Ontario Living Wage Network and Better Way Alliance and commit to paying a properly calculated living wage for their region. That "living wage" ranges from $15.53 in London to $21.75 in Toronto. They dispute that "high turnover, low pay" has ever been a smart business model, and hold the best employees are the ones who are healthy and properly paid. In June 2017, 64 per cent of small and medium business owners supported a $15 minimum wage by 2019, higher than the rate of support in the general population. Rocco Rossi needs to start listening to rank and file Chamber members — all of them, not just the big business allies paying him to lobby for them — and realize that for many businesses the principles the OCC advocates are callous, out of date and counterproductive. Just like his tweet.